The Teslin River is a broad wilderness river. It flows through a completely uninhabited region, and it is ideal for inexperienced canoeists as there are no dangerous obstacles or rapids. Day 1: You will be picked up from the airport and brought into Whitehorse to your hotel. In the city we will visit the SS Klondike paddle wheeler and the Whitehorse Rapids Fishway. We will also go to the visitor center and watch a film about the Yukon. Afterwards, we will have a communal dinner. Day 2: We will drive on the Alaska Highway to the put in at Johnson's Crossing. There we will have a nice coffee break and enjoy some famous cinnamon buns from the local bakery. Day 3-9:We will paddle a total of 370 km on the Teslin River and Yukon River by the end of our tour. Along the way we will be fishing for pike and grayling. There is usually a great deal of wildlife to be seen. In camp we will bake bannock on the campfire. Little hikes are also on the itinerary. Campground where there are showers and toilets. Day 11: We will drive 390 km on the Klondike and Dempster Highway to the Tombstone Mountains. Here we will overnight at the Tombstone Campground. On the way we stop to observe the famous Five Finger Rapids. Day 12: We will hike in the Tombstone Mountains, where we can enjoy a magnificent view over the North Klondike River valley and, see the beginning of the tundra. Then we will drive 110 km to Dawson City; the famous Gold Rush town on the Klondike River. We will spend the evening at "Diamond Tooth Gertie's" casino. Here we will see the show put on by lovely can-can dancers. Our overnight will be in a Dawson City hotel. Day 13: We will spend the day sightseeing and with a drive up the "Midnight Dome" mountain, to see a splendid view of Dawson city and the Yukon River valley. Today we will also go to Bonanza Creek and the gold digger "Dredge # 4." We will also visit Hunker Creek, a real gold claim, panning for gold just as they did a hundred years ago. Then we will begin the 200 km trip back to Whitehorse, overnighting at Moose Creek Campground. Day 14: We will drive the remaining 340 km back to Whitehorse on the Klondike Highway. There will be some time upon our arrival for a stroll through the city and some shopping. We will eat dinner together and then you will overnight at the hotel. Prerequisites: This tour is very suitable for beginners canoeists. 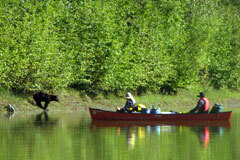 However, we recommend to acquire basic canoeing knowledge on rivers before embarking on this trip. An average physical condition is recommended as we are paddling up to 6 hours in the canoe and taking occasional day hikes.